This page is about the Soviet medium tank T-34-85E. For other uses, see T-34 (Family). The IV is a gift rank IV Soviet medium tank with a battle rating of 5.7 (AB/RB/SB). It was introduced in Update 1.49 "Weapons of Victory". 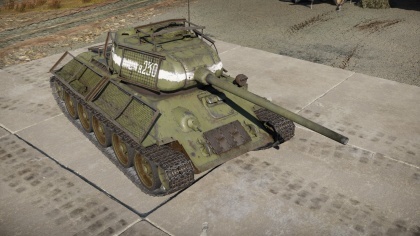 Essentially a gift version of the T-34-85, it has nearly the same characteristics and the only difference would be the mesh screens added onto the turret and hull. It was discontinued after the 2018 Victory Day sales. The T-34-85E is an improvement over the original's predecessor, the T-34-85 (D-5T) with a better armament, ammo, and an additional crew member. Aside from that, the two's technical specification are pretty much the same. As the T-34-85E is statistically the same as the T-34-85, many of the latter's strategy work well in the former. The T-34-85E's best play style is that of a flanker. 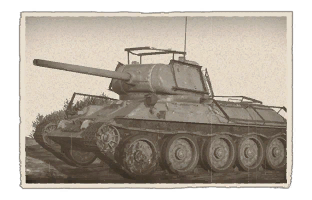 Due to its high mobility, fast turret traverse, and a capable cannon with excellent post-penetration damage, the T-34-85E fills this role perfectly. Since the turret is so tall, it makes combat behind low obstacles difficult, as the turret segment above the main gun is visible. The T-34-85E's other play style can be as a support tank, by keeping up with more protected vehicles like the IS-2 and supplement firepower while their heavy armament reloads. The T-34-85E would not make a very suitable short-range brawler though even with the 85 mm gun as the gun has a rather tedious reload for the specific play style and the T-34's armour is very poor at its BR. With that, the T-34-85E would tend to be able to fire one shot at a close enemy before it gets taken out by other enemies nearby. However, it is understandable that the situation is unavoidable, so it is recommended to stay steady by firing one shot at an unsuspecting enemy at close range before retreating to reload, evading enemy shots. Unlike the original T-34-85 which has 40 mm armor plates behind the 90 mm thick gun mantlet, this vehicle doesn't have those additional 40 mm armor plates. See here. The T-34-85E can do well in many environments with its battle role, though it is recommended to stay away from large open areas as bigger guns like the Tiger's 88 mm can chew up the T-34-85E from a long-range. Thus, it is best to stay in cover and concealments, like fighting in the forests and urban areas. Using its mobility, attempt to flank enemy tanks to hit them before they realize where the T-34-85E is. Even if caught in a frontal engagement, the 85 mm gun can dish out enough penetration to get through weak points on most enemy tanks like the Tiger I's front hull plate and the Panther's gun mantlet. In these engagement, keep little hope in hull armour and hull angling, shoot first and evade, otherwise enemy tanks will be able to destroy the T-34-85E easily. Any enemy vehicle around the T-34-85E's BR bracket can destroy it if it can get a solid shot on the hull armour. Beware when exposing hull when coming out to take a shot on an enemy, someone is bound to be watching for the T-34-85E and they won't be afraid to plant a shell into the 45 mm hull armour. Even if upgunned with the 85 mm gun with a much more protective turret, the T-34-85E's hull armour is just as thick as it was on the 1942 variant. As such, the T-34-85E is very vulnerable to tanks BR 5.7 and higher since they have guns able to tear through the armour. As such, it is best to keep T-34-85E away from the front arc of beasts like the Panther, Tiger I, and IS-2 and try aiming for their much more vulnerable side armour. It is best for the T-34-85E to do so as the post-penetration damage of the 85 mm gun can do much more damage hitting through the side right into the middle of the hull than it is from the front. Against medium tanks like M4A3 Shermans, Panzer IVs, and other T-34-85Es, it is safe to fight them frontally as long as the player T-34-85E gets the first, penetrating shot on the enemy tank, as the first tank to shoot and hit tends to be the winner. 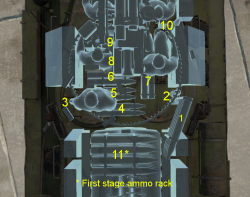 Benefits from a designated loader in the crew, a first for the T34 series, resulting in faster reload. 5 crew-members also means survivability is significantly increased. Wire mesh screens do little against HEATFS, let alone any normal HEAT rounds. Testings with various of guns in Soviet inventory against captured German tanks showed that the most capable gun was the 85 mm 52-K anti-aircraft gun. With this discovery, the 52-K underwent development to make derivatives able to be mounted onto a tank. The cannon was able to penetrate the front of the Tiger from 500 meters out, the turret side from 600 meters away, and the hull side from 800 meters away. However, the cannon was much larger than the F-34 gun and so a much larger turret was necessary to house the gun. The solution to this was to transfer the turret from the cancelled T-43 tank program onto the T-34, this increased the turret ring diameter from the original 1,425 mm into 1,600 mm, which required a retooling in the manufacturing plants. While this delayed T-34 production, the 85 mm was finally able to be mounted onto the T-34 as the T-34-85. The 85 mm gun was derived from the 52-K anti-aircraft gun, which was developed from Vasilliy Grabin and Fyodor Petrov's design bureaus. Petrov's bureaus produced the 85 mm D-5T gun while Grabin's design, after being taken over by A. Savin, produced the 85 mm ZiS-53 gun. During trials in the Gorokhoviesky Proving Grounds, it was found that the ZiS-53 gun was much better than the D-5T and was much simpler, which was redesignated as the ZiS-S-53 after Savin's initials. However, as the new turret was optimized with the D-5T gun, the T-34-85 started with the D-5T as the T-34-85 Model 1943, this model ran on from February to March 1944. After March 1944, the 85 mm ZiS-5 were used as the armament of the T-34-85 Model 1944 on a more optimized three-man turret. During its production life from 1943 to 1958, up to 48,950 T-34-85s were created (22,559 of which during World War II), consisting of more than half of the total 84,070 T-34 units created in its entire production life since 1940. In the final months of World War II, the T-34-85 was still very adequate as a medium tank, but the high casualties suffered by the fanatic defenders of Germany and their anti-tank weapons made the crew seek out a way to increase the tank's survivability against these infantry weapons. The crew improvised in the field modifications, and one of the method to shield the T-34s was to apply thin metal sheets or mesh screens onto the T-34 body in hopes that it would disrupt the warheads of Panzerfaust or Panzershrecks before it detonates on the hull. These improvised T-34-85s were called T-34-85E with "E" for "ekranami" or "with screens". However, it was found that these improvisation actually did not reliably stop an anti-tank warhead from penetrating the armour of the tank, or even disrupt the flight path to the target, the warhead would often just tear through the extra screens and hit the hull. Therefore, the practice of adding these screens was actually not widespread throughout the entire armoured forces, but enough were made that they were documented during the Battle of Berlin in many historical photographs as casualties from the tank crew man are so high that any chances of survival are taken in hopes of living to fight another day. Overall, except with the addition of improvised screenings, the T-34-85E performed just like a regular T-34-85 in terms of mobility and firepower. 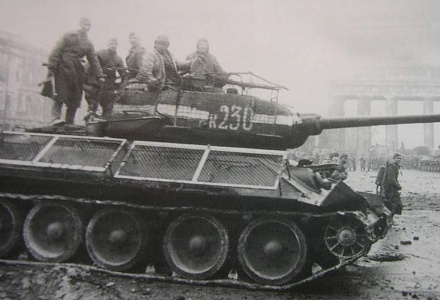 Historical photo of the T-34-85E. This page was last edited on 2 April 2019, at 18:20.